Hi. Just got Finale 25 and have all updates. I've created a score with the wizard and used the "Create new ensemble", General, Handwritten (jazz font) option. It currently has only one staff, an electric bass part. I've entered some bass notes and it plays back fine. But when I add chords I still hear only the bass line, no chords. "Enable chord playback" is checked in the Chord menu. What am I missing? I don't know if it's related but in the chord Suffix Keynumber Offsets window, all the fields have zeros for all the chords. I tried adding some (for a simple Bb7 chord) and still no playback. It's a treat to beat your feet. We are probably going to need to see the file. P.S. : I just created a file using your steps and Chord playback works. There's something up in your file. P.P.S. : Actually, only major plays. All the other chords are blank for playback. So, you will need to add the definitions for playback yourself. I guess the file used to create this look is deficient. My suggestion: either edit the JazzCord suffixes for you playback preference, or delete all of them and load the JazzText Library, which has the playback definitions (at least in the few I checked). I am guessing the JazzCord suffixes have never had playback defined. P.S. : I checked back in older versions of Finale. It appears the JazzCord font chord library has never had playback assigned. Oh well. Further exploration reveals if you select Fretboard for playback, then the chords will play. Apparently the fretboard definitions have playback defined, but not the chord suffixes themselves. So, you can still use the JazzCord font and get playback. P.S. : the attached file has the first 4 bars with only the major chord suffixes playing. The same 4 bars on the second system have the option for fretboard playback selected. This file has been downloaded 113 time(s). Also check the Score Manager to see what instrument is assigned to the chords. If it is a VST (Garritan) double bass, the chord notes are probably out of range. Thank you for the help. I deleted all the chord suffixes from the Chord Suffix Definition window, then loaded the Jazz Text Chord Suffix library. Sure enough, the newly loaded suffixes had their definitions and SOME of the chords are playing back. However, some aren't (and the ones that aren't don't have suffixes). So, I'm wondering if Derrek is onto something. I've opened the Score Manager but can't see where to assign an instrument to chord playback. I tried uploading the file but get the message: You cannot upload files that use MIME type : application/x-zip-compressed. No. The Score Manager is not the cause. Did you try my suggestion? P.S. : I apologize. The range is the issue. I tested this. Sorry. I had missed what Derrek said. Yes, I tried your suggestion and that's what seemed to work. However, as I mentioned, some of the chords with no suffixes still don't play. Only some. Strange. That's what made me think it may be an issue with the range, as Derrek suggested. Just curious, how do you change the instrument that plays the chords? Use Google Chrome to easily upload here. Windows IE has issues in that regard. 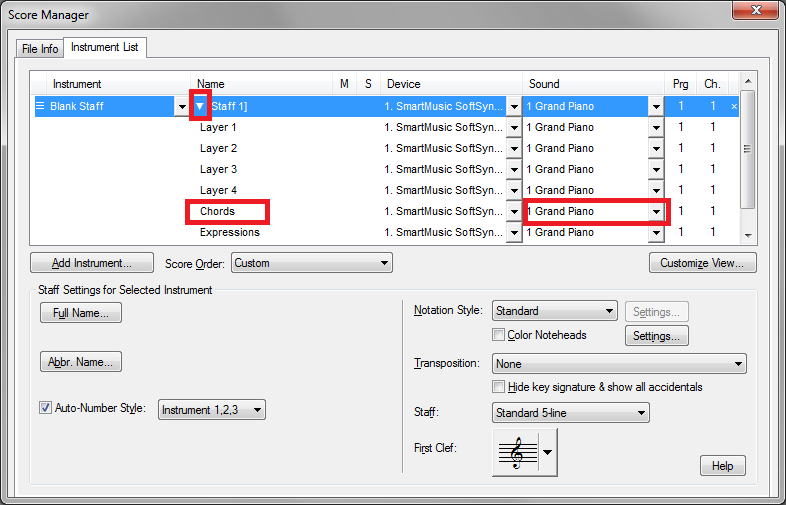 To change the instrument for the chords, click the arrow next to the instrument name. Down the list is chords. Change it to a guitar or other compatible instrument, and you should get playback. Since the JazzCord library doesn't have definitions, they will all play a major triad. So you still have work to do. Of course. Chrome. Should have thought of that. I've uploaded the file. Start playback at Rehearsal "D" and you'll note the chords play until the Bb and C chords. Later the A doesn't play either. This file has been downloaded 117 time(s). Try this with Guitar assigned to Chords. This file has been downloaded 121 time(s). Excellent. Thank you. So...how did you change the chord playback instrument to guitar? What instrument was it set to before? And why didn't it work before? Is it easy to just set it to a piano? Piano should work too. Once you see Chords in the dropdown list, you change it in the Sound column. By default, the sound is the same as the chosen instrument of the staff. This one. I mentioned how to get it a few posts back. It's in the Score manager. This image has been viewed 175 time(s). This image has been viewed 208 time(s). Got it. You've helped a lot. One more thing though. Why was it that some of the chords sounded and some didn't before the change to the guitar (or piano or whatever)? Because, with Garritan Instruments, there is a set range. Bass is low, and chords tend to be high. Only some of the notes would play, or none at all, because they were outside the range of the Bass sample. Ah, yes, of course. Just as Derrek guessed. I really appreciate your help, Zuill. Thanks.